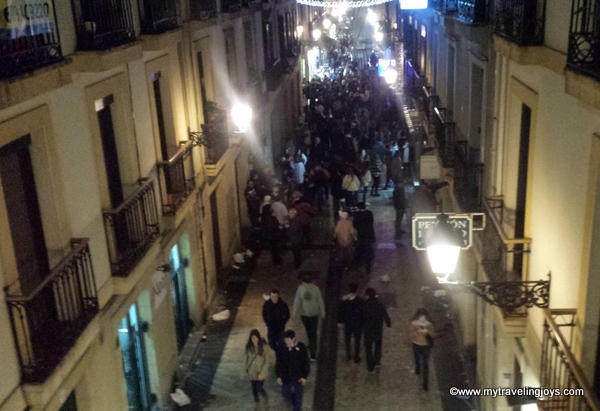 If you ever want to party in San Sebastian, Spain, the 21st of December is a good day to choose. By now, most people over the age of, oh say, 16 are probably intoxicated in this Basque city. Why? St. Thomas Feast Day takes place on 21st of December. On this day, San Sebastian is transformed into a lively rural market and city-wide party. The celebration is centered on Constitución Square, where the stalls are set up to serve traditional local products such as Basque cider, txistorra (a local sausage), cheeses and pastries. Locals gathered in Constitución Square in San Sebastian. Trying some local Basque cheese at the market! But as the sun sets, the party spreads far and wide across the city. In fact, by dinner time, most families have retreated and the city is ruled by youth under the age of 30. We were not prepared for how crazy the city got and our plan to go tapa bar hopping was quickly adjusted so we avoided the main city center and headed to the neighborhood of Gros instead. St. Thomas Day dates back to the 19th century when farmers used to come into San Sebastian to pay rent to their landlords, but would take advantage of this opportunity to sell their own products to neighboring villages. The day may be like a GIANT one-day Christmas market, but in reality, this day certainly is, is a great excuse to party, party, party! Besides the food what I loved most about the celebration was how many people dressed up in traditional Basque clothing – from little dogs, young children to teenagers and adults old enough to be my grandparents. Even though I learned to speak Latin American English, this wasn’t always handy in San Sebastian. But a few friendly nods and asking for dos glasses of the local cider or red wine seemed to be all the Spanish we really needed to know. Everyone was so jovial that we felt like part of the party. It’s been exactly two years since we were here and I still remember our time here almost like it was yesterday. Sigh! This month, I’m cheating and using more than one photo for the last A-Z Guidebook post of 2016. (Sorry Fiona!) I’m linking this post to the monthly travel guide link up organized by Fiona, a fellow Australian blogger, at Tiffin Bite Sized Food Adventures. Each month features a new letter of the alphabet. This month is the letter “S.” Please pop on over to Fiona’s blog to read more travel stories or feel free to link up your own! We've visited Spain twice, both times in Winter and both times for a month. On one visit we caught the ferry from Plymouth to Santander but didn't make it as far east as San Sebastian. It looks similar to Bilbao, with it's narrow streets and of course, I know some of the best restaurants in the world reside there. Another one for the list - I'd certainly be happy to return to Spain when the weather was slightly warmer! Happy New Year from Courmayeur, Italy!